Imagine the world's best EDM festivals like Tomorrowland (Belgium), Stereosonic (Australia), Ultra Music Festival (Miami), Electric Daisy Carnival (Vegas) to happen here in the Philippines. It used to a be a vision too far away, but with visionaries and movers like Kat Dalisay of Manic Nightning Productions, one does not need to imagine it anymore because someday, this vision will soon become a reality everyone can experience. Davao City made history with last year's Carte Blanche 2013, the first ever Electric Music Carnival to be held in Davao, or even in Mindanao. And this year, on its second year, Manic Nightning Productions is putting Davao on the spotlight again with a bigger, better and more explosive version, the Carte Blanche 2014. And just like last year’s first installment, this is a festival to give life to each person’s freedom to express himself or herself. 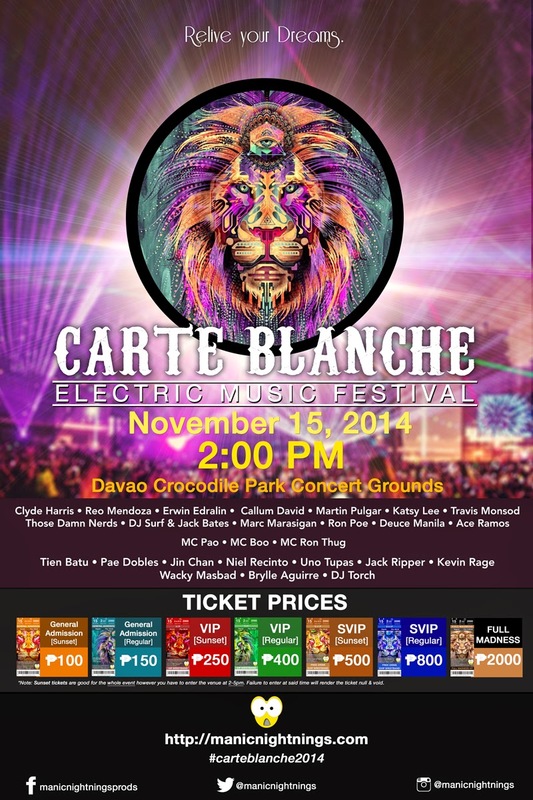 Carte Blanche: Electric Music Carnival, Davao’s very own electronic music dance festival, is all set to shake the grounds at the Crocodile Park Concert Park on November 15, 2014. Two large fields at the Crocodile Park will be occupied for the entire production. One will be The Carnival. Carnival rides and fun booths will be open to keep the fun level high for everyone. The other field will be The Rave Field where all the dancing will happen. This year’s lineup of DJs will be as big, if not bigger, as last year’s. The musical styles will be as varied as the carnival colors. House music from Clyde Harris, Reo Mendoza and Erwin Edralin. Tech and techno beats from Callum David and Martin Pulgar. Trap, dubstep and a mix of everything else from Mark Nicosia, Mia Ayessa and Regina Reinoso collectively known as Those Damn Nerds. And all the anthems and big room festival sounds from DJ Surf & Jack Bates, Marc Marasigan, Travis Monsod, Deuce Manila, Ron Poe and Ace Ramos. Davao’s very own DJs will complete the lineup - Tien Batu, Pae Dobles, Jin Chan, Niel Recinto, Uno Tupas, Jack Ripper, Kevin Rage, Brylle Aguirre, Wacky Masbad and DJ Torch. Carte Blanche’s gates will open at 2PM. The music will also start at the same time. Sunset Carte Blanche tickets are priced at P500 (SVIP), P250 (VIP), P100 (GA). Sunset tickets are good for the whole event but you have to enter the event premises at 2-5pm. Failure to do so will make your ticket null and void. 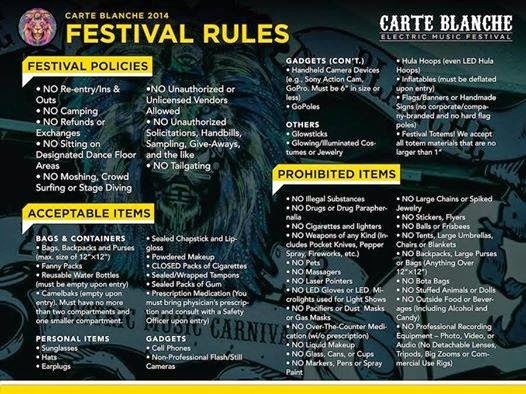 Prior to the event, be sure to check out these rules to fully enjoy the festival experience. For more information, you may visit the event page at: http://bit.ly/CarteBlanche2014 or follow Manic NightningsProductions on Facebook.